The highly-successful Carden Method is a complete curriculum in which all subjects are interrelated and reinforced both within and among grade levels. Lessons are taught in a clear, sequential manner. This orderly, consistent approach facilitates learning and provides our students with a thorough academic foundation. To develop a child’s full potential, a positive school experience is vital. Miss Carden’s carefully-sequenced curriculum and gradual, step-by-step approach help build confidence; her method ensures a secure environment that allows each child to realize his or her potential. The core subjects are taught in small groups through the fifth grade. Grouping guarantees greater individual attention, increases participation, and heightens a child’s eagerness to learn. It helps to meet the individual needs of each child. The Carden Method teaches children how to think, rather than what to think. We encourage our students to think for themselves, to reach their own logical conclusions, and to express their ideas with clarity. 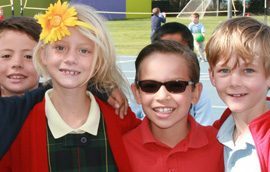 Carden Hall students do not merely learn; they are inspired to learn. Miss Carden’s reading program is built upon phonetic word attack skills, understanding of grammatical construction, keyword and title, rhythm, mental imagery, and vocabulary development. Attention is given to sequence, fluency, organization of thought, and recall. Miss Carden’s spelling curriculum is a unique combination of phonics, listening skills, clarity of diction, rhythm, and organization. Her careful sequence and clear rules open up the world of words to even our youngest students. In addition, words commonly considered exceptions are organized into groupings to help the students gain a command of them. Miss Carden understood that “grammar is the key to comprehension.” Grammar is taught at all grade levels, beginning with the fundamentals in the junior primary year. Our English program presents grammatical concepts in simple terms, providing our students with the keys to success in the early grades. Formal terminology is introduced gradually as the students advance through the grade levels. Grammar is taught daily through grade seven, and in small groups through grade four. Sentence analysis (questions answered, parts of speech, and parts of the sentence) facilitates reading fluency and comprehension, as well as the utilization of these tools in writing. Punctuation and application are emphasized. In the upper grades, students learn advanced concepts such as sentence diagramming and complex structure. Students graduate from Carden Hall with a command of the English language that few college students can equal. Carden-taught students appreciate and enjoy fine literature. In order to build an awareness and appreciation of the richness of our language and of our heritage, the Carden Method is replete with classical literature. The classics that Miss Carden selected convey enduring ideas and values, uplifting themes, and the traits of a strong character. The beautiful language and vivid imagery in these stories inspire a love of reading and an excitement about the written word. The literature also provides a rich source for vocabulary. Students acquire skills in writing poetry, creative stories, descriptive essays, summaries, analytical and expository essays, and theme analyses. Since writing is a creative process and a means of self-expression, the teacher establishes a positive, supportive atmosphere of acceptance. The Carden composition program makes it easy for students to learn to write well as it builds writing skills sequentially. We start with basic structures and patterns and expand upon each through the grade levels. This deliberate, step-by-step approach fosters logical, coherent writing that grows in sophistication each year. “Poetry breathes beauty into the commonplace and lifts the soul,” noted Miss Carden. Thus, it is an essential part of the Carden curriculum. At each grade level the students learn, recite, and compose a variety of poems that appeal to a sense of beauty, goodness, and humor. The children enjoy playing with rhythm and rhymes, and they learn to appreciate the vivid imagery that poetry provides. At all grade levels poetic expression nurtures a love for language and a sensitivity to life. Beginning in third grade, students study history and geography within a particular historical time frame. In third through fifth grades, Miss Carden’s reading techniques are applied to the lessons, with a focus on sentence analysis, key word, and title. When applied to history, this approach emphasizes main ideas, sequence, and organization. Dictation, recall, map work, reference work, oral and written reports, and outlining are other applications of Miss Carden’s approach to history. In sixth through eighth grades, history also serves as a vehicle to teach textbook skills, research skills, outlining and note-taking techniques, and test-taking skills in a variety of formats. The math curriculum at Carden Hall provides students with a strong foundation in mathematics by focusing on visual understanding, number sense, connections between topics, problem solving, and concept mastery. Utilizing the internationally recognized Singapore Math curriculum, our approach creates confident and competent students who both understand and enjoy mathematics. To gain number sense, students learn to make connections between concrete, pictorial, and abstract math concepts. As they work with and manipulate numbers, students build fluency and strengthen their mental math strategies. Providing a solid framework for all future math courses, our lower grade math program focuses not only on math fact mastery but also on building a love of numbers. In grades six through eight, the mathematics program is comprised of two tracks. 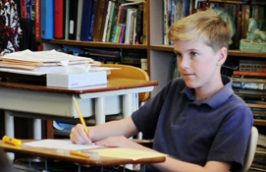 Students in the Algebra track will pursue a course of study that will culminate in the completion of Algebra I during the eighth grade. The course of study for students in the Geometry track will include the completion of Algebra I in the seventh grade and the completion of Geometry in the 8th grade. Carden Hall students learn science utilizing the STEM program, which integrates science, technology, engineering, and mathematics throughout the curriculum. This program includes student-directed learning, which allows the students to be innovators while using creative and critical thinking skills. STEM enriches science education by encouraging students to apply lessons to laboratory experiences and by providing real-world applications. Up through fourth grade, students attend a weekly science class taught by a science instructor in a specialized lab. In each class students discuss a concept or hypothetical situation and then creatively solve a problem together. These young students learn through hands-on science, technology, and engineering activities. In fifth and sixth grades, students study STEM lessons bi-weekly, and in the junior high, they attend daily science classes. The seventh grade curriculum focuses on life science with an introduction to biology, while the eighth grade curriculum focuses on chemistry and physics. Eighth grade students also conduct a nine-week, independently-designed science experiment culminating in a public display in our Science Fair. Field trips, including the Aquarium of the Pacific, Catalina Island Mountain and Sea Camp, and Idyllwild Astro Camp, complement our classroom studies. As technology advances at an ever-increasing pace, Carden Hall is continually updating its curriculum to meet the needs of the students of today and innovators of the future. Technology is not used as a substitute for teaching but rather to enrich the classroom experience. Carden Hall believes, first and foremost, in teaching children to think. Once that is established, technology becomes a venue in which to apply that skill. In first grade, we begin a four-year program of keyboarding and coding. Solid keyboarding skills increase speed and accuracy as students use iPads and computers. Coding, which many consider the “language” of the future, teaches creative, logical thinking and trial and error approaches, which encourage students to take risks and to learn from their mistakes. In every grade level students incorporate projects using iPads into their lessons throughout the year. All of our computer lessons are intentional, serving both the students and the rich curriculum. By junior high, lessons are integrated into all the academic subjects, such as: creating bar graphs in Excel utilizing data from science class; generating tables and dividing documents into columns for verb work in English and French; and formatting papers and creative assignments in Microsoft Word. Our junior high students are taught to use Microsoft Office Suite™. In 8th grade they apply these skills to create Science Fair projects, Term Papers, and PowerPoint presentations. Carden Hall graduates are prepared to think clearly and to use the tools of technology to support their success in high school, college, and beyond. Carden Hall has a long tradition of teaching French because it is the official language of 32 countries and, thus, important diplomatically around the world. In addition, over one third of our English words are of French origin. Our French program emphasizes communication skills. We use a method where the students acquire language in a natural fashion. The classes include oral stories, readings, and cultural lessons that are appropriate to the age and mastery level of the students at each grade level. As the children progress in their skills, they develop the ability to read short novels and to communicate their original ideas in French. To complement our French program, students in seventh grade have the opportunity to travel to France over Spring Break. Our fine arts program offers each child the opportunity for individual, creative expression. The students learn to work with a variety of tools and materials. Skills are taught in a sequential manner, and techniques are refined as the students advance through the grade levels. We stress that art is not only for the artistically gifted; every student can experience joy and pride in his own expression of creativity. At all levels, art appreciation is taught through discussions centered around the works of the Masters. This aspect of our art program also encourages our students to become alert observers of the world around them. The design of the Carden Hall music curriculum builds the love of music and the joy of singing. Skills such as pitch, rhythm, tempo, dynamics, harmony, theory, choral singing, and performance are introduced in a sequential manner. Music classes run daily through grade four and three times weekly in the upper grades. Vocal music is an integral part of our assemblies each Monday and Friday, and special music programs are presented throughout the year. The eighth graders stage and perform a musical in the spring. At all grade levels physical education classes are taught daily and provide opportunities for our students to practice the standards of behavior that are presented in the classroom. Good sportsmanship is emphasized, and skills are introduced in a sequential manner. When appropriate, students in third through eighth grade are grouped by ability and response to teaching. This approach provides maximum opportunity for improvement and mastery of fundamental skills, and it allows each child the opportunity to experience growth and success. 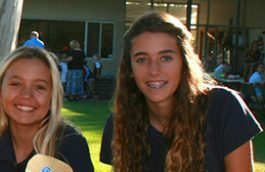 In the upper grades the students receive instruction in each of the team sports. Participation, cooperation, leadership, responsibility, and respect are a few of the qualities that are emphasized on the Carden Hall sports fields. 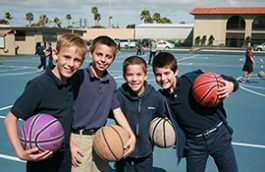 Our after-school sports program offers the sixth through eighth graders an opportunity to participate on competitive teams in football, volleyball, basketball, and soccer.